Last month, the Information Warfare Community, to which I have been a proud member for 25 years and counting, convened a board to screen officers for their next career milestone. As is true with the posting of the results after each board, there were people who were excited to read their name on the list of selected individuals and there were people disappointed to see their name omitted. I spoke with teammates from both camps soon after they were released. Fortunately for me and my family, my name has beed included on the list of selected individuals at every opportunity thus far in my career. That was true until the last two boards where I would have been considered amongst my peers for what we now consider the post-Major Command milestone, Information Warfare Commander (IWC) for a Carrier Strike Group. Some would argue that it is the pinnacle of a career Information Warfare Officer. I’d like to re-enforce the words considered and would. Would: The would is where I get a bit conflicted. You see, I was not considered because I asked not to be. That was a decision I chose to make the last two years. It was not an easy decision. After all, we are conditioned to want to be among the best of the fully qualified (the selected) and we most certainly have a strong desire to serve in the most significant ways possible. Our board model does a great job incentivizing such behavior and enabling opportunity for those ready by all definitions. Like every other board, I wanted the validation that came with being among the selected. Unlike every other board, I felt there were other more significant ways in which I could serve. I am not saying that I am above being the IWC in a Carrier Strike Group and I don’t know that I would be particularly good at it. But after thoughtful reflection, I knew that many of my peers were equally, if not better, equipped to succeed in that role. I also knew that most of them were more eager for the opportunity than I was. And quite frankly, there was one job that I knew I could do better than any of them and I didn’t want selection to stand in the way of the opportunity I am enjoying right now. Asking to not be considered enhanced the odds that one of my more eager, equally/more ready teammates saw his/her name on the list and will ultimately serve in this important capacity. At the same time, it allowed me the opportunity to serve in a role that I truly believe to be the most significant way in which I can serve at this point in my career. Maybe not the most significant way to serve, but definitely the most significant way I could serve. The day the list came out, I was pleased to see the names of many great teammates. And I will freely admit that not seeing my name among these longtime friends and colleagues made my stomach sink. They remained on due course from a career progression standpoint, where I chose to veer off in the eyes of some. That night with that sinking stomach feeling still present, I picked my son up from swim practice and he was more excited than normal. Uncharacteristic of him, he asked me to stop the car so he could make eye contact with me. With a big smile, he looked me in the eye and said, “Dad, I am so happy here. Thank you so much for taking these orders.” The next day I went to work with my new amazing team and was once again reminded I am exactly where I need to be. And when one of my teammates fortunate enough to be selected for IWC formally joins their new team, I am confident they will be able to say the same. Seeing our name on a list is validating. But sometimes the best thing we can do for the team and the larger organization to which we belong (not to mention our family), is to ensure our name is not on that list. How are you readying yourself for consideration and success for the next career milestone? Is there a scenario in which you are willing to veer off course? How did you feel the last time you were not selected for something? Great article Sir. I can’t imagine turning down a milestone opportunity much earlier in my career than you did, although I think I can identify with your reasons. The problem is for most milestones it’s extremely difficult, if not impossible to get back on track for progression after turning one down. Sometimes it seems that the duration of a Naval Officer’s career is most dependent on how much sacrifice the Officer can live with. An subtle and important difference in terminology. Turning down an opportunity after being selected is unfair to the institution in large part because you took an opportunity from someone else. Asking to not be considered gives someone else an opportunity they might not have had otherwise. I did not turn down a milestone. The Navy family you have for maybe 30 years if you’re lucky (the more cynical might use another phrase! ); but, the family you have by blood, marriage, or mutual consent you have for the rest of your life (or theirs). I, too, have been blessed to be selected the first time out of the gate for every opportunity. There will be a time when that won’t be true. I just have to trust that there is a plan and that everything works out in the end. Good words for a member of any community. As we move up the chain and the decision to stay “on the path” becomes more influenced by life, family, and frankly, the continued sacrifice required by that trajectory. Best of luck in the new position, CAPT. I’ve got a JO trying to work his way into working with your team! It is so important to have your priorities in the right order and things such as family must remain on top because they will be here long after your career is gone. Or not. It’s all about what’s really important to you. Thanks for the article. I’ll be sharing this at my next Khaki training. The decision to move on to a new challenge can happen in almost any part of one’s career. In my case, I decided about 3 years into my first Navy tour (as a CT) that I wanted to go back to college and pursue a career in the broadcast business. I did, and practiced that profession until I realized that I was getting “too old” for that foolishness and my wife had secured a good teaching position. I knew that any future in broadcast would require my moving to another part of the country so I transitioned into being a computer consultant. My sales experience in broadcast equipped me to do that. As you continue any career, eventually you realize that the things that attracted you to that career are no longer there because the scope of your job has changed. Adding a family that you won’t sacrifice is another good reason to consider a change. I just wanted to run a different kind of team. Yes, I stayed in the Naval Cryptologic Reserve and continued to advance, and ran those teams – most of them very successful – winding up with my “guys” essentially running the watch at NOSIC during Desert Storm. As I approach my “dotage,” I find that the lessons learned in the Navy and beyond help me with various volunteer projects, and in those areas I’m able to help build small teams that accomplish much. The moral is that sometimes you just have to weigh your present situation, and make a decision that is right for both you and your family. It sounds like CAPT Heritage did just that. Well done CAPT! You made the right decision! Most of us love the CWO, IWC and the Navy. We just love the mission! Yes, it is true that at some point all of us have to do a job (check in the box) as a small sacrifice to be able to continue progressing and promote. But, we need to ask ourselves what is it that we want to do in the Navy, and then after retirement? What job excites us? our experiences DO follow us. Is the milestone worth the next career move? or will it sets us back? I believe in small sacrifices, but I believe in “Living the dream!” and that if you love what you do, the job becomes enjoyable! “Marvelous” and you never have to work another day in your life. The day the job is not enjoyable, and then it’s time to move on or get another job. IWC in a CVN is the new shiny object for those who want to do it. For some of us, it is not shiny at all. Great points. We need to accommodate individual interests and leverage individual strengths where it makes sense. We are leading as a team after all…we ought to acknowledge our interdependence and the complementary nature of our responsibilities/expertise. Great words Sean! Also, the milestone list does not and should not define our value or self-worth as an naval officer, regardless of the outcome. In my case I did not make the milestone list at O5. Family and life events preventing me from accomplishing a required item going into the milestone board. I of course did not screen and that put me on a different trajectory. I chose to put my family first in that situation and I never regretted that aspect, but at first I was very disappointed in myself (I should have been able to accomplish everything, family and career, right? )…until I recognized the tremendous opportunities this situation provided me. I took care of my family and I went on to become Current Ops at NNWC and then the Navy’s Cybersecurity testing lead for CANES, and neither position would have been available to me had I been selected for a milestone. In both positions I made a far greater impact in the Navy than I would have if I had been selected for a real “milestone” (A bit ironically, the NNWC job became a milestone later). 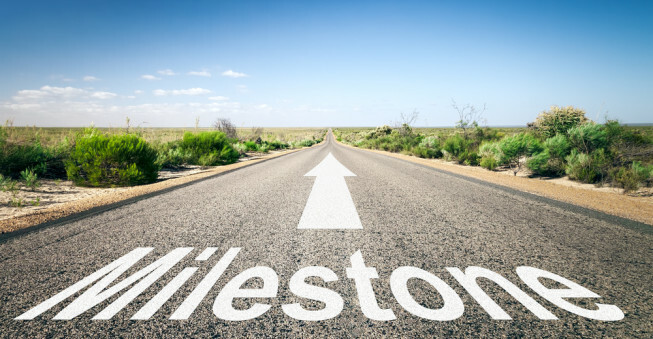 In the end, I did not let the milestone list define me and the contributions I could make. Life, and the Lord – if we trust in Him, have a way working things out for the better if we work hard and do and focus on what’s right.